As summer started to turn into autumn the entourage of the evil winter god Tawiskaron began to return. First the winter god’s nephews would race through the forests shooting trees with their ethereal arrows with flint heads, causing the leaves to die and fall from the trees. Shagodiaqdane would stubbornly hold on as long as she could but would eventually be forced to leave, returning the following year. 5. OTSOON – The strawberry god and a son of the vegetation god Akonwara. He won the first strawberry patch on the Earth by destroying the four female wolf-monsters who considered it their own and would prey on people or on other animals tempted by the smell of the strawberries. Otsoon killed them by finding where they hid their hearts and destroying them. He then guarded over the strawberry bushes himself and would allow cuttings from them to be taken after proper rituals were observed. Thus strawberries spread to other places in the world. 4. YEYENTHWUS – The goddess of chestnut trees. She was the sister of Otgoe the wampum god and of Hodadeion the god of magic. Hodadeion secured the first chestnut trees for her after a series of adventures and magically transported them next to Yeyenthwus’ longhouse lodge. She then oversaw those trees the way Otsoon oversaw strawberries. She could use chestnut bark in various magical ways as when she helped her brother Hodadeion walk across water on chestnut bark to escape a cannibalistic medicine man. 3. AIRESKOI – The Iroquois god of war, identified with the Aurora Borealis. While other Iroquois would go to the conventional afterlife warriors slain in battle got to reside with Aireskoi in the heavens, their souls glowing with the grandeur of their battlefied heroics, thus accounting for the brightness of the Aurora Borealis. Aireskoi was one of the gods who tried to woo the goddess Iagentci when she was carrying her Marriage Bread to the chief deity Hawenneyu. Aireskoi was also associated with fire since the Iroquois used fire to torture captives taken in wartime. The war god’s son Djissaa was the god of fire and he would punish anyone who frivolously used fire, including one man who used it to kill snakes in a famous myth. 2. ONHDAGWIJA – The moose goddess. The most prominent myth featuring her depicts her falling in love with an Iroquois hunter. She assumes human form and begins preparing acorn bread for him in his temporary bark cabin while he is off hunting during the day. The hunter is curious about who is doing this and “stakes out” his cabin one day after pretending to go off on the hunt again. He catches Ohndagwija doing cooking and cleaning chores for him and she reveals her true identity to him. She promises to be his lover, to make acorn bread and other meals for him and to ensure that he catches large amounts of game. In return the hunter had to promise not to marry and never to reveal that she was helping him. Years go by and the couple have children together but ultimately the hunter yields to one of the many women throwing themselves at him because of his hunting prowess so Onhdagwija and the children turn back into moose and disappear into the forest forever. 1. GASYONDETHA – The Iroquois meteor god. Like the war god he tried to woo Iagentci when she was taking Marriage Bread to Hawenneyu. Gasyondetha was associated not just with meteors and comets blazing across the sky but also with ones that struck the earth in Iroquois territory. These fallen meteors were considered Gasyondetha’s teeth, which he would sometimes pluck out of his mouth as a show of fortitude and toss to the earth below. 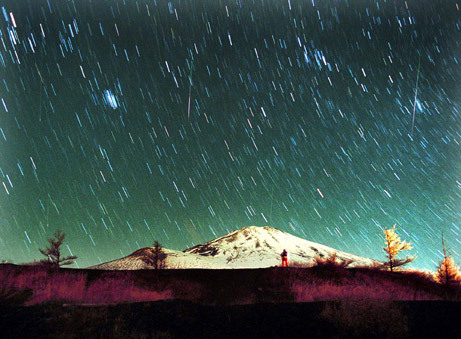 Many unusual rock formations that were NOT really meteors were mistakenly believed to be fallen meteors by the Iroquois in ancient times. The lines, cracks and uneven markings on the sides of meteors (and stones thought to be meteors) were supposedly stories written in an alphabet only medicine men could understand. The medicine translated those “writings” into various tales of the gods. 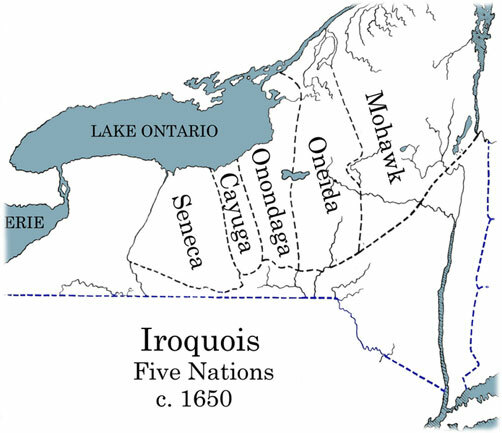 This was related in a myth about the origin of Iroquois religious and historical stories. In other versions, stones that were believed to be meteors were said to talk to medicine men, thus passing along the stories. One of the most famous myths involving Gasyondetha involved the god visiting an Iroquois man- Svengedaigea – in a dream warning him about monsters coming to devour everyone in his village. Nobody believed the man, not even his wife and family so Gasyondetha ordered him to abandon the village and all its inhabitants to their fate. The god led the man to a fallen meteor with a hole in it. Through the hole Svengedaigea witnessed the destruction of his old village and everyone in it. Next Gasyondetha had him shoot arrows into the hole and the arrows immediately pierced the images of the monsters in the image, killing them. The meteor god then gave Svengedaigea one of his teeth, which would enable him to assume animal form and other feats of magic. He commanded the Iroquois man to lead Gasyondetha’s ancient foe, the giagantic blue lizard Dzainos, on a merry chase. Eventually that chase led to a pit made by a meteor and that pit transported the man and Dzainos to the land of the gods on the other side of the sky. Once there Gasyondetha met his archenemy in final combat and at last destroyed the gigantic lizard forever. He then showed Svengedaigea some of the sights in the land of the gods, like their tree-sized corn and the sun-tree of the chief deity Hawenneyu. Finally Gasyondetha returned the mortal to Earth, where a new bride and a new home awaited him. Hi Balladeer: Are there other monster slayer heroes you haven’t made articles for yet that you plan to do in the future ( if there are can you name some, so I can do some research of my own). Hello! I didn’t have any lined up for the immediate future, I’m afraid.